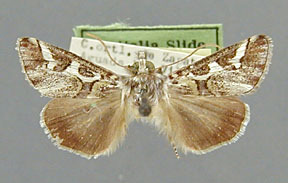 Caularis lunata Hampson, 1904, Ann. Mag. Nat. Hist., series 7, 14: 169. Diagnosis: The male antennae are pectinate. 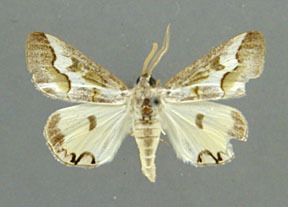 The overall color of the male forewing is olive-brown, but the median areas is white, contrasting with the olive-brown reniform. The lower half of the median area and the costa are dusted with black. The reniform is moon-shaped and conspicuous. In contrast the orbicular is an obscure, triangular patch. The postmedial line is heavily accented with dark brown, and outbowed in the region of the reniform. The Hindwing light yellow with a large, conspicuous discal dot. A series of well marked black lunules filled with dull pink occur at the inner angle of the wing. Female unknown. 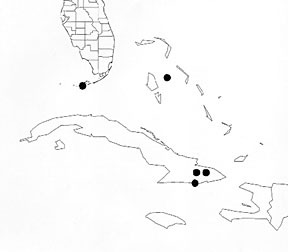 Distribution: This species occurs in the southern Florida Keys, the Bahamas, and Cuba. 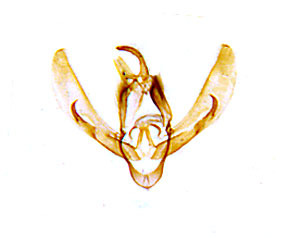 Althought there is a slight general similarity between this species and Neotuerta hemicycla, hemicycla is a brown species. In particular the median area of hemicycla is greatly constricted between the antemedial and postmedial lines near the inner margin and below the orbicular and reniform.